Corvette Mods brings you a full catalog of exhaust enhancer plates that include the smooth Billet chrome to Corvette race-flag logos. 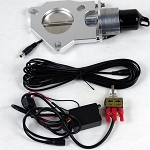 Exhaust enhancer plates fit just right with stock exhaust systems but also work with some aftermarket exhausts. Our exhaust enhancer plates come in stainless steel, chrome and custom -- including the iconic Corvette flags emblem. Corvette exhaust accessories are essential to giving your Vette a little extra flavor. The installation for the plates on the Corvette exhaust is easy: it bolts to the Corvette’s rear without having to remove any part of the exhaust. The bolts do have to be loosened a little for the plate to slide in between the bolts, and then tighten them back. Install the exhaust enhancer plates on your Vette and ride in style. As you drive by, onlookers will have no choice but to enjoy watching your undercarriage. The C6 Corvette exhaust enhancer plates come in a variety of colors, designs and materials to provide you with the perfect option or your customization. 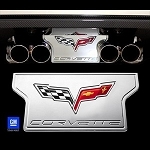 These are designed to be mounted between your exhaust pipes, accentuating the beautiful stock or custom exhaust you have installed; giving your Corvette's rear end a gorgeous custom design that will keep heads turning. They come in carbon fiber, billet aluminum, chrome plated, stainless steel and more. Our designs have logos for C5, Z06, 50th anniversary, cross flags and more. Our plates will fit on a variety of Corvette models, like the C6 Corvette and other common models from 1997 to 2013. Our large inventory of enhancer plates also comes in a variety of price options, so whatever your budget, we’ll have the enhancer plates for your C6.